As regular readers will know I’ve been befuddled by DBMM for well over a year now! In fact I posted my first attempt at deciphering the new game on 15th September 2007. I have to say that things have improved since then and I am less befuddled than I was but there’s still some way to go. My most recent experience with DBMM was at the Northern DBM Doubles League (now with added DBMM & FOG for 2008). Chatting to the regular players it became clear that even they don’t expect to remember everything. It’s takes a fraction too long to find the right grid. The grids are organised by opponent not by your element. With superior vs. superior combats you have to look twice. I’ve reorganised the grids so that it’s clearer and uses less space. 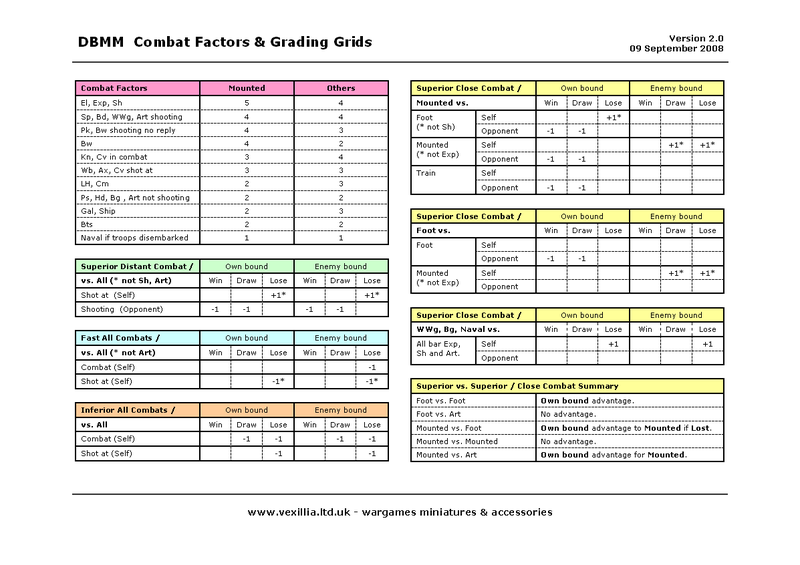 Added the basic combat factor table in the new space. Added colour coding (which I always try to avoid). Added a summary for superior vs. superior close combats. 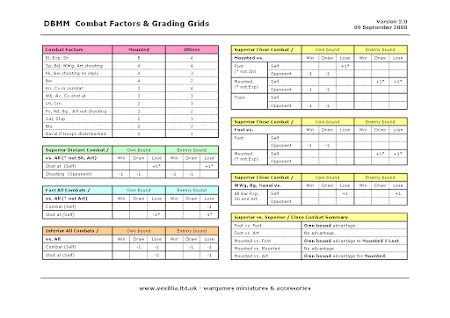 I hope that the next time I use this the colours will guide my eye and when I’m doing combats between superior troops I’ll be able to check at a glance if the grading has an impact. As usual the new version is available as a pdf download and all is feedback welcome. I have missed a few posts- plenty to read today! Glad you had a good weekend of gaming and was able to see how to improve your grids by experience. Tell me though, why do you like DBMM if it is so befuddling? Is it the very complexity that you like to get to grips with? I never said I liked DBMM! ;-) Seriously, it's a great system hindered by some awful documentation and presentation. In 2007 I was a reasonable club DBM and DBR player and enjoying my games immensely. However, DBMM really threw me for quite a while. The DBM to DBMM transition is a hard one. After six months I was close to packing in DBMM but I persevered. My aim was, and still is to some extent, to get back to playing the game rather than struggling with the rulebook all the time. In writing the grids I try to work on self contained sections of the rules to improve my understanding and reduce the amount of time spent reading the rules during a game. I suppose I've come to see the rulebook as a set of puzzles: once I've solved one I move onto the next. This approach is working. For example, writing the flowchart for starting a game helped me learn how the system worked and I like having the sheet with me just in case I can't remember any of it. Soon I won't need it at all but other people might benefit which is why they're posted here. I can see that your systematic approach is indeed working. You have put in an immense amount of work. So much in fact, that it makes me wonder why the author of the rules did not see the need for it in the first place. As an outsider to the whole DBx experience (I only started gaming about 6 years ago) it almost seems as if somebody had discovered some wargames rules written in ancient Anatolian or something; like, they could read the words OK but not discern the meaning. There is a mini-industry of guys on websites translating the Barkerese into meaningful English so people can play the game. DBx has given people many years of fun. James wonders why the rules are the way they are, IMO it is because the author has an internal mental model of how the rules "should" work - the written version is just a pale shadow of that - still bloody good fun though and that is why players put work into understanding it.